WOW WOW WOW!!!!! Chalk this one up to another Desmond-centric Episode that I absolutely loved! That brothaaa is one awesome character! And to think we went a whole season without him to kick off the show! Of course, probably like "Flashes Before Your Eyes," just because I absolutely loved the episode (penned by the executive producers themselves Damon Lindelof and Carlton Cuse), doesn't mean this recap will make one lick of sense! I am thoroughly confused! I'm sure we'll find our way once we start digging into it though. Wish me luck because here we go! "The Constant" follows Desmond and Sayid on their journey to the freighter. Their tourguide and pilot, Frank tries to heed Dan's advice to stick to the bearing they came in on. However when they pass through a storm cloud (or as Sayid branded a "Thunderhead"), Desmond goes all haywire. As opposed to "Flashes Before Your Eyes" last season where Desmond's PRESENT mind traveled back to the past where he was living with Penny; here we see Desmond's PAST consciousness experiencing and living out moments in the future (or PRESENT island time) then returning to the past at an exponentially quicker rate. Depending on where Dez's mind was at a particular moment, the other time period's Desmond would lose consciousness. Of course, it is important to know that Dez's PRESENT consciousness is nowhere to be found and his prior self must find his way back through "THE CONSTANT" in order to survive and send Dez BACK TO THE FUTURE!.....errrr bring his present mind back (doesn't sound as cool!)? Bottom line: That hatch really screwed this guy up! Sayid asks Frank why he's flying directly into this "thunderhead." I would assume this is because he was scared to sway from his course that Dan provided. 40 Miles N @ 305" 7 K East. Hmmm....Miles AND Kilometers? That's interesting! I guess the drawing isn't to scale either as the 7 Kilometers East looks like a longer trip than the 40 miles! Also, is it important to note that Frank's Gauge was reading 31??? If you recall, the difference between the Island and the Rocket fired from the freighter was 31 minutes. If only they could've punched in November 5th, 1955 we might have been able to stop Old Biff from giving Young Biff that Sports Almanac! As Desmond sits and waits and hopes to find answers on the freighter, we head towards the "thunderhead" and then Dez takes a trip back to 1996 when he was in the Scottish Army. Or really, Dez's past consciousness somehow took a trip to the future where he was on a helicopter! Thus we begin our crazy time tripping affair! You know, I was starting to think we may actually never see this crazy freighter! I thought they would do a bunch of hyping up of it, but never actually show us scenes on the freighter. Well, I can happily say, my fears were set aside! We met some new and interesting characters on the ship and I can easily say we're probably more confused than Desmond who has no idea where and when he is at this point! The name of the freighter is KAHANA. I've got nothing. The Sledgeweb folks tried to break down the Hawaiian translation, but I didn't see the relevance! But there it is folks...isnt' she a beaut? WE meet 2 new characters, Keemee (excuse the spelling, I have no idea what he said. I tried for a pronunciation!) from Las Vegas, and Omar from Florida. Keemee and Omar don't seem too thrilled with Frank from bringing Sayid and Desmond back to the freighter. Further showing that our Island Freighter folk are nowhere near the brains of this operation. They also mention they left port in Fiji so they know they are the Pacific Ocean somewhere. Hmmmm....seems like this island is sticking in one place for the time being. Flight 815 Pilot said they were headed towards Fiji or something after they were off course I think. Getting there from Florida and Nigeria (and apparently, Madagascar! )still To be Determined! These two NEW Freighter guys seem to know what is happening to Desmond (kinda) and they take him to the sick bay and lock him in there. This causes some Scottish screaming and rants and the almighty line from CLERKS "I'm not supposed to be here!!!" Then Creepy Doctor, Ray, arrives to inject George with some stuff. Dez's flipping out ensues! We didn't learn much about this doctor yet, but something tells me we haven't seen the last of him! It would seem that no one believes what is happening to George. He mentions that it's going to happen to everyone "ONCE THEY GO TO THAT ISLAND" I guess there are plans for everyone to go there? Ray tries to check Desmond's eyes with a light and then Dez trips back to the past. Connection? Oh I have no idea! Jack and Juliet are still waiting for a call from the freighter. Dan starts getting into differences in time, which Charlotte is aware of and not very fond of Dan's straight-forwardness. Dan says that Sayid and Desmond may not have been gone as long as they THINK they've been gone. There are potential Side-Effects with the flight. Hmmm Jack also mentions they've been gone a day before the communication but to the Chopper people, it seems like an hour or so later right? But they can still communicate in real time. Makes me think again back to that 1930's broadcast of the Glenn Miller song on the radio. I'm also confused with Jack saying it's been 100 days and it actually only being 92/93 days. It is noted later in the episode that it's Christmas Eve in the Freighter. I can only assume that Jack rounded up because it would make no sense (based on the past few episodes) that more days are passing on the island than off of the island! Anyway, they get the call from Sayid and he says Desmond is acting strange. Jack puts the phone on speaker. On the other end of the line Frank helps Sayid get to Desmond (well isn't he a nice guy?? )...then the magic happens! By the way, it is revealed that the SAT Phones can only talk to each other, so they can't call anyone else for help. Desmond and Dan begin their connection through time. We find out that the Dez we're hanging out with is 1996 Desmond. Dan, in 1996, is working at Oxford University in the Queen's College Physics Department. Dan gives Dezzy instructions to GO TO HIM (Marty/Doc Brown style) for help! Dan finds his journal to find information from 1996 that would help 96 Dan believe Desmond about '04 Dan. The directions? Device must be set to 2.342 and must be oscillating at 11Hz. If the numbers don't convince him say "I know about Elloise" We didn't get to speculate about Eloise too long, for she is revealed to us in Desmond's travels. Dan also mentions that the splits are unpredictable, sometimes lasting for years, sometimes for hours. Jack is confused asking if this has happened before. Hmmm....Is Dan a TIME-MIND traveler as well? Or was he referring to his "Eloise" experiments? Based on our cliffhanger, I with think it might be the former. Dan also asks Jack if Desmond had any lengthy periods of exposure to Radiation or Electro-magnetism. We, of course, know that Desmond did when the Hatch blew. Does Jack even know that Desmond turned that key and the whole thing blew? We never saw it on camera...but I guess we have to assume he was filled in. But he never learned of his Flashes of the future did he? I don't think so. Anyway, apparently Desmond was more succeptable to this "SIDE EFFECT" based on his Electro-magnetic event. Well kids, this may be the only explanation we get for what happened to Desmond after the hatch imploded. I'm still hoping for more! But it was still intriguing regardless! So here we are, the part of the blog I've been avoiding, but the part I want to discuss the most! Desmond's Travels through time. 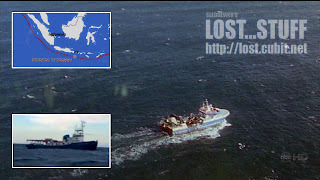 We follow Desmond's 1996 consciousness back and forth from 1996 (the military era) and 2004 (the freighter/island era). In both eras, Desmond has a goal in mind and has objectives in both time periods to accomplish in order to FIX himself. 1955 Doc Brown (errr...1996 Dan Faraday) helps Desmond find his way. Well first, let me say I'm happy that we got to spend sometime with Desmond during his military days. I remember saying at the end of season 3 that we couldn't entirely be done with flashbacks because we needed more Desmond backstory for why he's eventually in military prison and dishonorably discharged from military services. Well, we didn't quite see that yet. Instead we see Desmond and his unit being punished for him spacing out a couple times during the day. But eventually, through conversations he realizes that the only thing familiar to him in the future was Penny. He saw the picture of Penny in his hands so they must still have some sort of tie. Desmond calls Penny and it is revealed, just as we speculated, that Desmond broke up with Penny and joined the military (just as we saw beginning to happen in season 3's "Flashes Before Your Eyes"). Penny wanted nothing to do with Desmond and hung up on him. Keep in mind. By this point, Dez has talked to Dan in the future and has his mission to head to Oxford. He finds Dan there, sporting some kind of pseudo Mullett (love it!!) and unloads the information he was instructed to. 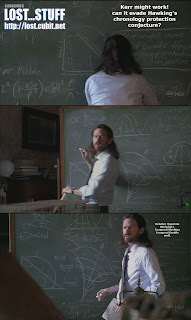 As an aside, Jeremy Davies is a great addition to the LOST cast. He pulls off this nerdy, intelligent, creepy Scientist guy perfectly! He felt he was being put on by his colleagues but at the same time seemed to be anticipating this moment by all his meddling with the space-time continuum. Haven't you ever sat around wondering...."if we've invented time travel in the future, couldn't there be people from the future here right now???" Okay...maybe that was just dorky, teenage me! Dan takes Dez to his lab where he performs experiments that the university "frowns upon." Dan starts setting his equipment to Desmond's specifications. He also puts on a radiation vest (looks like one of those things you wear at the dentist when getting an x-ray!) There is a mention of why isn't Dan protecting his HEAD from long-term effects of the radiation.....perhaps that's why he has gone completely nuts? Anyway, it turns out Eloise is a RAT that Dan has been experimenting on. After the his equipment is set, he takes some type of Lightning device and ZAP...strikes Elloise with it. Eloise's consciousness slips into the future, then comes back and runs through a maze that she wasn't to learn until an hour from then. Dum dum dummmmmmm Time Paradox #1! So was future Dan the one to tell past Dan how to make the mind travel through time? How could this happen without causing some major ripple in TIME? Are the producers willing to explain this? Probably not....but they definitely knew they were opening this door with the Time Travel element of the show! I'm sure smarter brains than I can poke more holes in or support what they did here! Feel free to comment to make ME smarter! Oh, in case you want to look at Dan's scribbles on the chalkboard, here it goes. Best thing I can get out of it is the reference to Steven Hawking who wrote "A Brief History of Time" which also has been referenced on the show. Plus you get to see that fantastic Mullet! Speaking of One Timeline, it is reinforced by Dan that "you cannot change the future" another reference to Course Correction that Mrs. Hawking (there's that name again!) referred to in "Flashes Before Your Eyes" hmmmm wait...maybe Mrs. Hawking was Mind Traveling too??? Hold the PHONE! Maybe the chalkboard is referring to Mrs. Hawking and NOT Steven Hawking! Is Dan related to Mrs. Hawking? woaaaaaaa And then...does Dan know Desmond's former Monk friend/boss? Ahhh crazy crazy crazy! Anyway, with the course correction comments, we are reinforcing PREDESTINATION on LOST. Anything that is changed in the past will ultimately be corrected to provide the same future. Remember Desmond trying to save Charlie? Yep, exactly. Let's return to present day for a sec shall we? Keemee and Omar come in to interrupt Dez's conversation with Dan. Frank tries to explain to them what's going on. They are furious that Frank let Dez and Faraday talk "Faraday can't even help himself!" A reference is made to taking Frank to the Captain. Whom Sayid also wants to see. Hmmm something tells me this Captain is going to be a character we're going to need to know a little better. Do you think it might be someone we already know? George Minkowski gets wind of Desmond's name. He then provides us with some answers that we've been trying to piece together since that season 3 finale. He revealed he is the Communications Officer on the freighter. 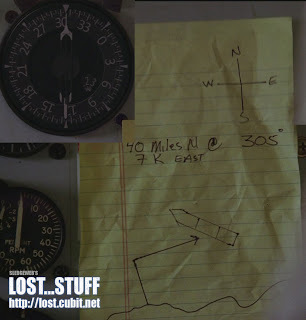 The freighter folk picked up Penny's various attempts to contact Desmond (which Charlie gets once the Rousseau's message is stopped at the radio tower). George was ordered never to pick up the call. But someone on the ship did their homework on Penelope Widmore. Just like they did their homework on the Flight 815 crew. Could this explain why Naomi was carrying a picture of Dez and Penny? It doesn't explain how they got that EXACT picture! George also talks about how he's been cursed with the Time travel bug. He and a fellow freighter, Brandon got bored out of their minds waiting for their next instructions and wanted to see the island. They took a boat from the freighter and started heading that way. But before they got there Brandon started acting strange. He ended up in a body bag. And George is heading that way too. '96 Dan explains to Desmond, after Eloise died, that eventually the time shifts become exponentially shorter until you die. The only way to kill the shift is to find a constant. Something that is familiar to you in both eras. We already knew where this was going right? PENNY!!! Desmond leaves Oxford and heads to London to find Charles Widmore (ahhh finally! we're getting somewhere with Widmore!). We enter an Auction for paraphernalia from the BLACK ROCK!!! Woaaaa. In particular, the 1st Mate's Journal which contains information never revealed to the public. We get information that the Black Rock set sail March 22, 1845. The Journal was found in Madagascar 7 years later. Book has "Ledger" on the binding. (2/21/2019 - Edited thanks to comments!) So Madagascar is in the Indian Ocean. Bali' is in the Indian Ocean. 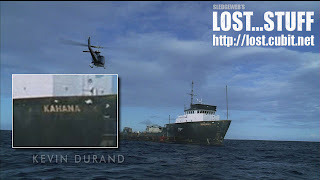 The expedition crew that found FAKE Flight 815 was in search of the Black Rock. But if they're in the Pacific Ocean...how did the Black Rock end up on the island? And why was the journal in Madagascar? Oh right, the former owner of the Journal? Tovard Hanso! A descendant of Alvar? Whomever it is...we finally have linked Charles Widmore to the Hanso Corporation which thus links to DHARMA! We will learn later this episode that Penny knows about the island through research. Through her father's research? Our speculations are TRUE! Widmore is involved! FREIGHTER level of Involvement?? Well...not quite sure about that yet. Desmond, back in 2004, realizes he must get in contact with Penny. Apparently, George tells usk, something happened on the freighter where the communications room was destroyed. Based on the Producer's comments of the strike abbrevited season, we might not find out WHY until season 5. Anyway, we all know Sayid can work magic with wires and electronics, so they head towards the door and realize it's open. George mentions that they "must have a friend on this boat" Hmmmm Walt? Michael? Frank? Frank was visiting the captain. So perhaps whoever Ben's contact is...is the one that opened the door? George eventually spaces out and it's too late for him...his time traveling causes his death. RIP George, we barely knew ya...even if we've heard of you since the end of season 3! They get to the control room and Sayid mentions he will have something up in running in a "few minutes." That's Sayid for you! Have I mentioned how patient and understanding Sayid was through this entire episode even though Desmond was acting completely nuts? As mentioned before, it is indicated that it is Christmas Eve. 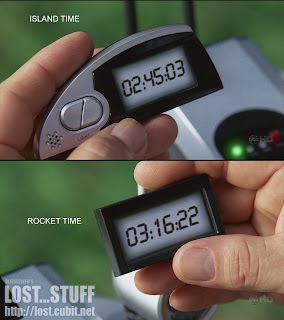 And apparently, the ENHANCED LOST episode that aired prior to "The Constant" indicated that 93 days have passed on the island. So Jack must've just estimated to 100 days. MERRY CHRISTMAS LOSTIES!!! Sayid mentions that he needs Desmond to remember a phone number to contact Penny. But he doesn't! CUE TIME TRAVEL! Desmond heads to Penny's address 423 (the numbers yet again) Cheyne Walk. Just thought I'd point out that 4 and 23 are indeed 2 of our infamous numbers! Man what did we do prior to the Penny/Dezzy storyline? What did we have to look forward to? This is powerful stuff! Desmond explains to Penny how he knows it's over but he just needs her phone number so that he can call her in 8 years on December 24, 2004. As much as she tries to resist. She DOES give it to him. And Desmond keeps his promise not to contact Penny until that date. Even though we know Penny contacted him at the stadium where Desmond meets Jack. Desmond returns to 2004, nose bleeding and all, with a phone number. Sayid mentions the "perfect timing" which I couldn't help but laugh when he said it. That Iraqi dude just cracks me up! And then if you didn't cry during this scene (or almost cry) you're not human! Penny picks up the phone! Past Desmond leaves Penny's house realizing that everything is fixed. Present Desmond returns and realizes where he is and who Sayid is and tells Penny what's been going on. Penny tells Dez she knows about the island. 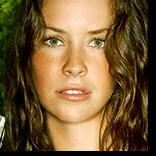 She's been researching and looking for him for 3 years and when she talked to Charlie she knew she wasn't crazy. And that she won't give up her search. They express their love for each other. And then the battery dies. GREAT SCENE! Desmond finds his constant and now he's perfect. Does that mean his POST Hatch "SIDE EFFECTS" are now at an end? Sounds like it. For now at least. So, let's tie the PENNY events together shall we? Penny says she's been looking for Desmond for 3 years (which was our speculation after the season 2 finale when she said "with enough money and determination you can find anyone") .....she also says in the recent episode "i know about the island" so she must've done research on the electro-magnetic activity too, because that's what she was looking for. And then of course...once they detected this she had an idea of where she should be directing her lines of communication which at the end of season 3 we see reaches the eyes and ears of charlie. Yet, also apparently was reaching the freighter folk too. Enter Desmond/Penny's picture that Naomi had. So what on earth happened here? I think I'm repeating myself from up above, but I'm too lazy to check! 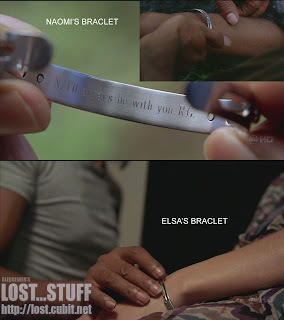 Was Naomi really looking for Desmond? Was that her mission? 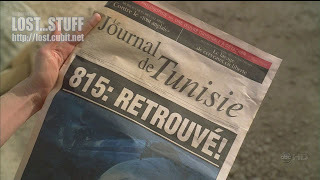 Or was that her cover before she knew Flight 815 was there? But then again, she asked Abbaddon "What if there are survivors of flight 815?" So she must've known they crashed there. Yikes.. 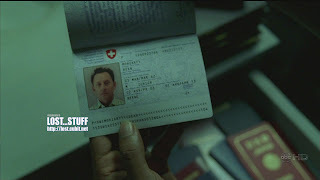 When all is said and done, we see Dan looking through his journal only to come to a page that said "If Anything Goes wrong, Desmond Hume will be my constant" BOOM LOST! Well, he sure looked surprise to see that note didn't he? More Paradoxes???? Yikes! I'm not even going to try to analyze it. Because it sounds like we have more time traveling for Dan ahead of us. If you want to look at some pages of the journal, feel free! Someone shared with me a very excellenet observation. You know how we saw Desmond, George, and heard about Brandon going nuts and getting SICK from the eyes of everyone else? Well, what if this is what Rousseau was referring to when her people got sick and she killed them? Woaaa....George did mention that it would happen to everyone that went to the island. But why hasn't it impacted all of our 815ers? Does it have to do with traveling to the island by Boat? That's how Desmond got there, how Rousseau's people got there, AND how George/Brandon were getting there. Ahhhh interesting. DISCUSS! Quick note: we're back to getting 8 episodes prior to the break, so we have 3 more to look forward to before the end of April! That's it folks. Sorry for the novel. I'm sure you were all wondering how on earth I was going to recap this episode. By doing exactly what I did. Pretty much re-writing the script! Lots of crazy Time Travel elements to this one. And I look forward to seeing what you guys came up with. CUE CDSTEDMAN's Copy/Paste NOW! lol See you next week everyone! Whew...Happy Post V-Day everyone! As I stated last week, I'm a little late getting started on this thing. But, I didn't watch the show until around midnight so I think everyone can understand I needed some sleep to provide proper analysis of one crazy episode of LOST! They are unloading new mysteries on us at record pace, but...as always, I was digging it! The one thing I need to adjust to is the quicker pace of the show with these abbreviated seasons (and a defined target end date). Our Islanders seem to be finding their way across the island to its various locales very efficiently, in comparison to prior seasons where it seemed to take everyone 3 episodes to get across the island (or multiple days on the island). Yet sure enough...last night's episode all seemed to happen in an afternoon! Granted, with some new "LOST TIME" elements developing in "The Economist" maybe we're supposed to be picking up on this! But I doubt it! Anyway, I'm willing to look past the time constraints for a good story! And, I know the LOST brains are heading somewhere great! After letting the impact of this episode set in overnight, I will go ahead and stamp this episode with my WOW approval rating (really, does this mean anything anymore? I give every episode a WOW!). So basically this episode delved a little more into the mystery of the Freighter Folk's REAL objective on the island. Some Locke and Sayid play a chess game with their "hostages" and another member of the Oceanic 6 has been revealed (a correct prediction of mine!). Let's dive into the episode and see if we can sort out all of the craziness! Since the cast was moving around to all different locations, I'm going to break the storyline down into locations and the flash forward. Let's see how that works! We see Hurley begins to show doubts of his decision to go with Locke. He is not a big fan of being involved in a hostage situation. Locke gets scared when Jacob's house isn't there. He doesn't know what to do next. He is still being driven by any directions the island gives him. But he did come up with the hostage situation at the barracks all by himself. And everyone was willing to listen! 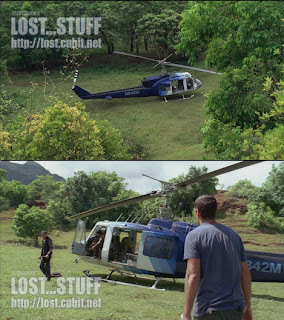 Sayid, Kate and Miles head to the barracks (in record time considering Ethan couldn't make it to the crash site from the barracks until nightfall and the chopper is only an hour from the crash site. oh well! on with the story!) to get Charlotte. Hurley plays his role in the trickery by saying he was left behind. Sawyer captures Kate, and Locke gets Sayid when Kate screams for help. Can't they all just get along??? Loved Hurley's one liner about Miles calling him Tubby "Oh great, the boat sent another Sawyer!" 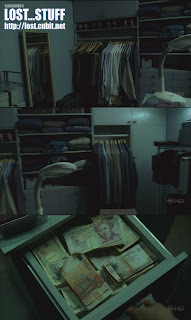 Sayid discovers a secret room in Ben's house. Looks like Ben has quite a Jason Bourne thing going on. Lots of passports, and various amounts of currency from all over the world. Ben has been doing some traveling, but why and of course...HOW?? "Dean Moriarty is one of the protagonists in Jack Kerouac's novel On the Road. Dean grew up in Colorado with a hobo/bum for a father for whom he searches on many occasions. Dean's fanatic personality races from journey to journey and pulls other people along. His various fixations include drugs, women, intellectualism and finally, his father and family life. His marriage and divorce with Camille and Mary Lou and his last affair with Inez are a few examples of his romantic entanglements." Also said that the novel suggests that Moriarity is the great grandson of Sherlock Holmes's rival Professor Moriarity. Sounds like just another literary reference. But the FATHER fixation fits ben. Sayid and Ben, as Lockian prisoners, have an interesting discussion prior to Locke arriving. Seemed pretty inconsequential at the time. But may hold more weight after certain other scenes transpired! But loved Ben's "I owe Locke a dollar" line. They are executing their one-liners at great success! Like this one too: Ben has a contact on their boat. Sayid "who is it" Ben "it's a secret" hysterical! Anyway, Sayid and Locke continue their chess game and end up trading "prisoners." Should be fun to see crazy Miles interacting with Sawyer, Ben, Hurley, Locke and crew. Jack is pretty much in a holding pattern for most of this episode, giving out orders and remaining behind to hang out with the Freigher guys. He sends Kate with Sayid saying Sawyer won't let anything happen to her. (The irony of Jack getting left behind and Kate enjoying it was a good time. And Jack had some good comebacks also. Ahhh gotta love Jack and Kate scenes. There weren't many of those in season 3!) 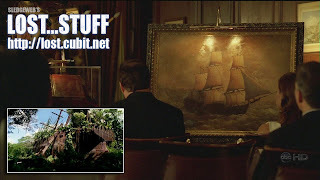 Jack also disperses Juliet to go get Desmond (in 2 hours) because of the picture Naomi was carrying. What is their real objective? Well the freighter guys are sticking to their story that they didn't know. As for them trying to get Ben? Miles says he doesn't know who Ben is, he was told by the people that hired him to find him. Doesn't sound like Miles has any vendetta against Ben. But why was he so fired up about it then last episode? Loved when Sayid told Jack he'd like to avoid bloodshed when dealing with Locke referencing Psycho Jack's pulling of the trigger at Locke's head. "That is not good diplomacy!" I am a little confused at why it took them so long to ask them about Naomi's relationship to Penny. They all had to have known about the picture before unless Desmond only dished the firt to Charlie, Jin and Hurley. But we always assume eventually everyone gets brought into the loop. Especially when you're bringing a whole crew to a radio tower while keeping some behind to go drown or kill others. Surely, you would bring up how the people on the freighter are within 6 degrees of Desmond? Oh well, it's a TV show right??? Jack (oops it was Desmond!! )did start questioning Frank and he said that Naomi was ranking officer, they didn't discuss things. I'm still thinking they all had their own mission on the island. (REVISED SINCE ORIGINAL POSTING) Actually Desmond questioned Frank and when Desmond said "i'm going to ask you one more time...tell me you never heard the name Penelope Widmore" Both Frank and Dan looked at each other with a concerned look....but made no comment. HMMMMMMM interesting! Dan conducts experiment with all his crazy gizmos. Before we get into the experiment. How about all of this Mankowski/Regina stuff going on? Frank said "if Mankowski answers...hang up" Dan wanted to talk to Regina. Last episode Miles wanted to talk to Mankowski and NOT Regina. What is going on over there??? Anyway, Dan asks Regina to fire a payload towards his coordinates. They timed it....Regina kept noting the distance of when it was supposed to get there but it didn't until 31 minutes later. Anyone get a Back to the Future flashback here? You know when Doc sent Einstein (his dog) 1 minute into the future? This had to be an homage to that scene with the clocks side by side and the difference..but at the same time further expanding out understanding of the crazy time elements of this island. Dan later warns Frank to head out on the same exact bearing they came in on. Remember when Ben told Michael and Walt to take a specific bearing when they left the island? 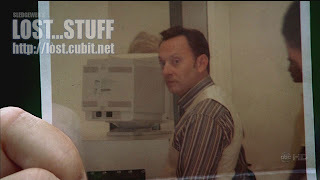 Based on the experiment, what if somehow both Michael AND Walt aged or went to the future or something? I dunno....so bizarre. Does Island transcend times? Does this tie into Desmond's visions of the future? Yikes...seems like we're finally getting somewhere with that. But not quite yet! When Sayid returns with just Charlotte (no Miles and Kate), Frank at first seemed concerned but then noted his disgust for Miles. These 4 people seem to all be there for their own purpose. Speaking of which, when heading back to the freighter, Charlotte and Dan decide to stay. They say they have work to do. We know Dan has already begun conducting his experiments on Time. We can only hope that he comes to some resolution with that! And we know Charlotte has a DHARMA/Polar Bear fixation, so we'll see if that heads somewhere! Sayid, Desmond, and Frank take Naomi's body and head back to freighter. My big question is...are we ever going to see this freighter??? With things moving so quickly on this show, I guess we may find out soon enough! Sayid is one of the Oceanic 6! Can I get a pat on the back please? Thanks! We did not see him linked to Nadia yet as I suspected (since she was in LA in that last Locke flashback we saw), but I guess it's always a possibility in an another Flash Forward at an earlier date? We don't know exactly when this flashforward takes place in relation to the other ones. But it seems like Sayid has been on his current mission for quite some time. Sayid mentions he was a recipient of a large settlement from the Oceanic Mess. So this begs the question, did Hurley end up with a large amount of money too even though he didn't want it? Was Kate a benefactor of a large settlement with her past record allowing her to be motivated again to leave the island? Based on the preview for next week, doesn't look like Kate is in hiding! yikes! I'm getting ahead of myself. Sayid is taking orders from a mysterious man to kill people on a list. Well, we sure know who likes making lists don't we? Anyway we'll get to that in a bit. Who are these people on the list? The guy at the golf course (Mr. Averdale?? Couldn't make that one out) looked really nervous once Sayid revealed he was an Oceanic 6er. He also seemed to have a lot of money since they were on some private Golf Course. Are they working their way to a Charles Widmore perhaps??? Sayid is seen wooing a woman in Berlin the rest of the episode, Elsa. Perhaps a shout-out to the German woman from Indiana Jones and the Last Crusade? (new teaser trailer is available for Indy 4 btw. Check yahoo!) Sayid is working to get to Elsa's boss (a supposed "Economist" working in emerging markets) but falls for her. Elsa turned out to be working Sayid from their "chance" meeting as well and gets a shot out on him. Sayid survives the shootout but kills Elsa. So was he really going for Elsa's boss or was Elsa the target? I'm thinking he failed his mission to get to her boss. Which again, I ask....Charles Widmore? Who knows? But Sayid's mysterious boss sure wants him dead! We see a wounded Sayid walk into some kind of Kennel/Vet/Animal testing establishment. It is revealed to us that none other than LIST LOVING Ben is the mastermind. woaaaa. Looks like Ben WILL be able to fix his current imprisonment on the island. So the question is, when did Ben learn how to remove bullets? Who are they working to kill? 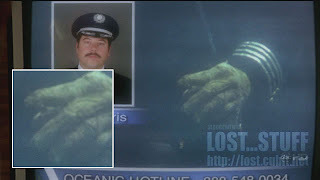 Is it for the benefit of the Oceanic 815ers as well as the island? Pretty crazy stuff! Ben discusses with Sayid not to let woman could his judgment. "These people don't deserve our sympathies" Are we still talking about the same people that are behind the Freighter operations? Elsa wanted to know who Sayid worked for. Are they still trying to get to Ben? What on earth is that Island and what on earth is Ben protecting on it???? Ben also mentions that Sayid has let love of a woman cloud his judgement before. Sayid mentions that Ben used her to recruit him to killing for her. Who was he referring to? Obviously, something we haven't seen yet. Could it be Nadia? Maybe not, sounds like something that happened on the island (of course, Ben knows how to bring people ONTO the island...see Locke's Dad). Perhaps it's a woman on the freighter since that's where Sayid is going next? or maybe Charlotte? Someone else? Who knows? Turns out Sayid is quite the Iraqi Ladies' Man! Why would Ben turn Sayid into a killing machine, he mentions it's to protect his friends? But Ben sure does love protecting that crazy island. 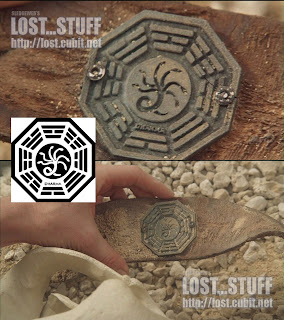 Ahhh the mysteries of LOST! Ben states to Sayid that he has another name for him. Sayid states now that he killed Elsa they know he's after them now. Ben creepily says "GOOOOOOD!" Boom....LOST! I'm postponing this discussion until we get something to work with. I guess with Ben being off the island, he IS a possibility. But I still say that neighborhood doesn't suit him! Plus, we see him in Germany in this latest flash forward. But I'm gonna guess they're trekking the globe to hunt these people down. Oh and does Ben have a way to get back to the island? He seems to have traveled back and forth before. Does Jack know Ben is off of the island? Why wouldn't he be looking for him to get back instead of flying everwhere hoping for a crash? Of course, maybe upon hearing of his death....(and we know he goes by many aliases based on the passports...so maybe they found his US Passport that has him living in New York).....Jack realized that his best chance to get back to the island is now gone. Well look at that! We DID have something to talk about! Man I'm good! Well, in case you guys haven't been following, or at least reading the comments in last week's blog. The Writer's Strike has ended and the LOST crew has a plan!!! Looks like they will continue to air the current string of episodes up until Episode 7 (instead of 8). They suggested that episode 7 is a more logical break point. 4 weeks later they will resume airing 6 episodes for a total of 13 Lost episodes (i'm guessing 2 of them will count as the 2 hour finale). 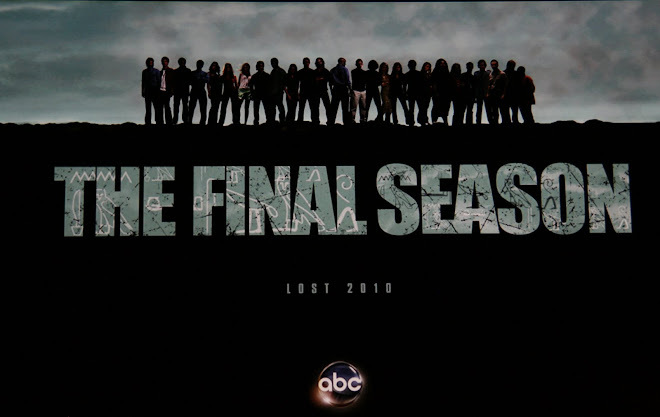 The 3 remaining hours that were supposed to be filmed will not be "LOST" as they will be carried over between seasons 5 and 6. Additional news? 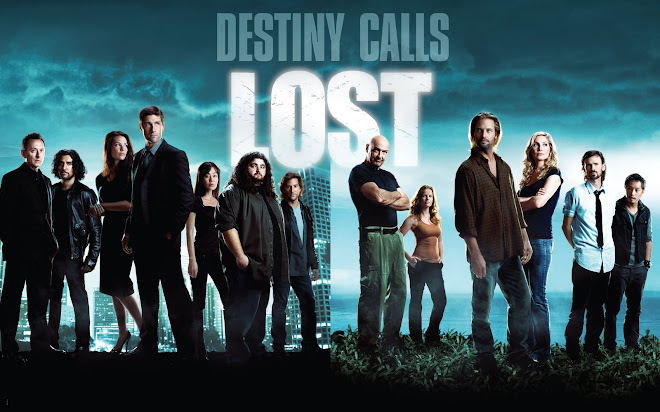 Sounds like LOST will assume the 10:00pm EST Timeslot following Grey's Anatomy on Thursday nights. This is GREAT for LOST. Since Grey's is a Ratings Behemoth (well American Idol would be the Behemoth, Grey's would be merely a Giant). But as for people who like to watch Lost on its own night and analyze the hell out of it (like yours truly)....this is a nightmare! I'm sure I'll find a way to manage. I'll have to learn how because it sounds like this might be a permanent location for LOST for the remainder of the show's run! Also, the 13 episodes will cover the story that was meant to be told in 16. So we will still be left with a great cliffhanger at the season's end! Fantastic news! Just wanted to share! That's it folks! Hope you enjoyed my ramblings as always. As stated before, I am out of town...so I probably won't be responding to many comments. But, I'm guessing the hit count will be lower today considering most people were out with their Valentine's last night and not watching LOST! The horror! See you next week as we reveal one more member of the Oceanic 6!